How would you feel when all your efforts put into a marketing campaign or other piece of content get your real consumers’ review: “ Works as advertised. 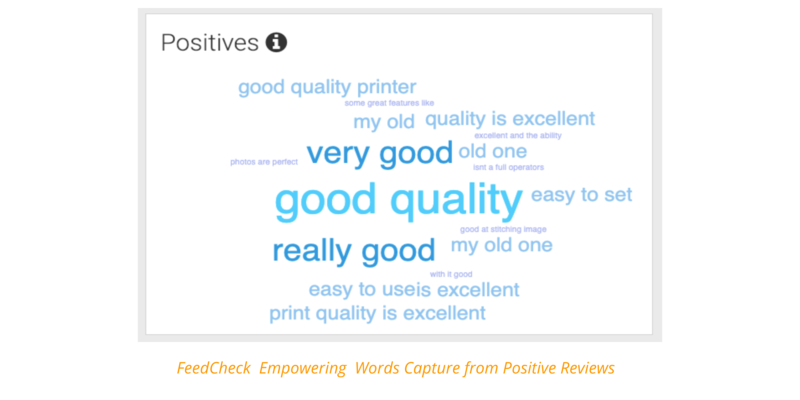 I like it.” Then it’s broadcasted in the marketplace – as one of our customers, a global consumer electronics brand, has recently experienced – and consumers find it helpful! With advertising losing credibility and people’s trust, isn’t such a public confirmation of your marketing efforts strengthening your brand name and value among consumers in the marketplace? Imagine this confirmation multiplied across the online space. Your consumers need and look for quality products. Brands look for consumer engagement. Products are your brand statement and your consumer reviews validate it. Every single day, at every hour, everywhere in the world on the eCommerce scene, product reviews influence a numerous and dynamic audience whose demographic segment, preferences, moods, lifestyle, experiences, and many other factors change as we speak and impact what people need, desire and eventually buy. In order to become engaged with whatever a brand wants to convey through its messaging, people need to feel highly- and consistently interested. If there’s interest, what does it take for the engagement to get activated? Marketing science has always dreamt of making a leap into consumers’ minds and understanding how to best empathize and truly connect with them. If you want your brand and marketing to resonate with your consumers, then start from your product reviews. They do not only help consumers find and gather information about your products but they’re the most authentic engaging platform for them. How to get to your product reviews? We see lots of brands with rich product-depth online offerings that feel they can’t keep track to what their consumers talk about in stores where their and competitor products are listed. They feel they miss salient consumer conversations that, if they could listen to, could give them plenty of ideas for their marketing campaigns and content. “But how can we listen to daily tens and hundreds of conversations and capture their drivers and crucial keywords and make sense of them on an on-going basis?” – one of our customers, a global manufacturer of baby care products asked. “We have over one hundred products in all sizes, for all baby ages. Parents’ opinions for each age category in a baby’s life matter to us. Consumers have interesting authentic ways in speaking their words about why certain product features make a difference for them while others don’t, how products exceed expectations and how they fail to keep up with a brand’s promise. Their contribution to helping their peers decide whether to purchase or not a product is a never-ending source of insights that marketers could use as inspiration. Getting to your product reviews and making sense of them can only be achieved in a connected environment that looks after consumer brands’ needs to perform better in their marketplace. 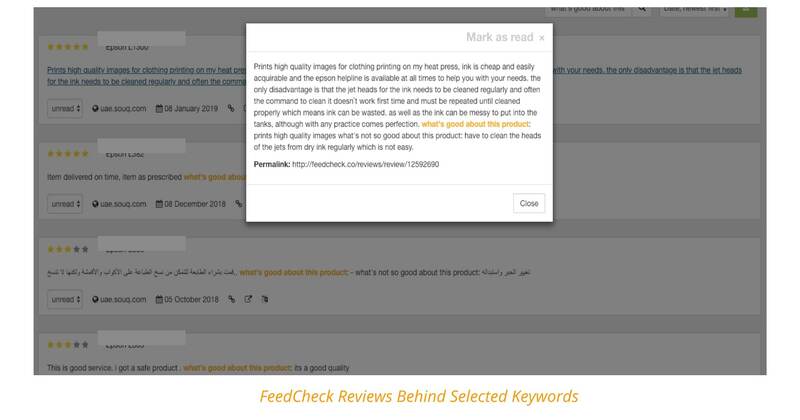 This is where FeedCheck plays a key role – that of connecting brands to their product reviews in a structured, organized and timely approach. 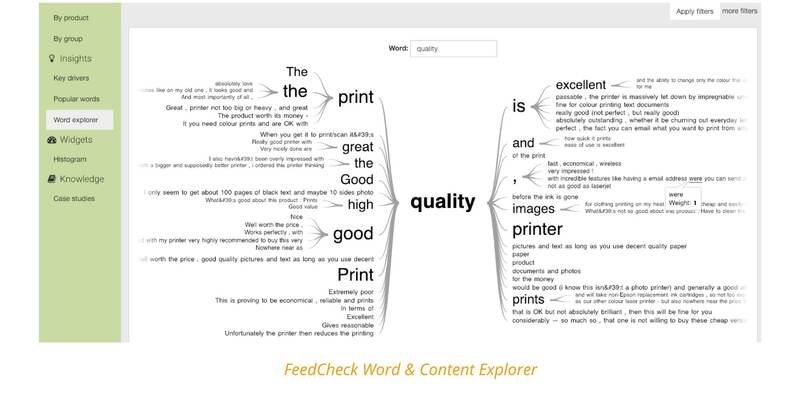 Request your FeedCheck personalized demo account today and start exploring and finding content inspiration in your product reviews.